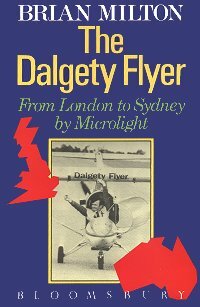 In 1987/8, Brian flew a tiny microlight aircraft, powered by a puny 447cc engine, from London to Sydney, in 59 days. It was, for 10 years, the longest, fastest microlight flight in history, despite 9 out-landings. These included being wrecked on a Greek island by cross-winds, and glueing the aircraft back together in six days. Brian landed on a road in Jordan, 1,200 feet below sea level, next to the Dead Sea, when his engine abruptly stopped as he was about to enter a mountain range, but next day he came under the patronage of King Hussein. He had three out-landings in the Saudi Desert, once because of a sand-storm, twice with rotten fuel. On Christmas Day, flying across the Persian Gulf at the height of the Iran/Iraq War, his engine stopped while 32 miles out to sea, and he ditched. Iranian gun-boats attacked two tankers just to the north, killing seven people, but didn't see Brian, who was rescued by an oil company helicopter. Six hours later he went back and rescued his microlight, dried it off in Abu Dhabi in five days, swapped engines (his mechanic, Mike Atkinson, on a First Class flight to Australia with 25 stop-overs, carried a spare engine as hand-baggage), and flew on. He had an out-landing in India, and nearly lost his reason for three days, haunted by a Djinn. But after further adventures, including more outlandings in Malaysia than at airfields, he finally reached Sydney, too late for the Bicentenary, but alive and with his aircraft still capable of a 4,000 mile flight around the Outback. Brian Milton makes an honest and courageous attempt to look at the relationship between the attraction of danger and a pilot's fear of flying, a subject which few aviators are prepared to discuss or even touch on in any depth. The book opens with an account of an almost unbelievably lucky escape in a hang-gliding accident which was recorded on film and shown on television. It sets the scene for an undercurrent of apprehension that continues throughout the book, surfacing here and there as an almost tangible dread. That is not to say that fear dominates the book, far from it. It was a trip of epic proportions, and there is a wealth of useful advice for anyone contemplating their own 'wheeze'. I must admit it has fired my imagination. I couldn't put it down. Recommended! It is an intensely personal story. All the fears, the worries, the difficult decisions and the mistakes are discussed with complete frankness. Brian makes no attempt to portray himself as a fearless hero; he describes in great detail how panic set in over India and he was possessed by an almost irresistible urge to jump out of the plane. So open is the style that the reader comes away feeling that if he met the author they would not be strangers.